If there's one thing my years of cooking have taught me, it's that the most important tools in your kitchen are your knives. Whether you are a professional or home cook good quality knives make a world of difference when it comes to having an effortless cooking experience. I recently received the Hammer Stahl 6-inch chef knife and 5.5-inch Santoku knife to try out and it wasn't long after removing them from the box that I found myself completely in love with these two beauties. They are sleek and have a comfortable grip that is just the right size for smaller hands. Although I usually prefer a heavier weighted knife, I do love how easy these are to handle. 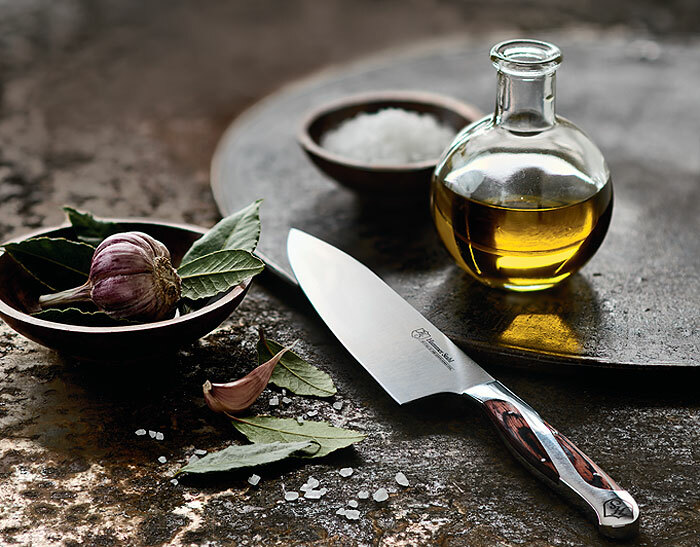 What I love most about the knives is that they are razor sharp and forged from top-quality high-carbon stainless steel. Slicing vegetables is a breeze with these knives no matter what your experience level. And if you travel with your knives, like I do, the shorter blades on these two make them the ideal size to take on trips. Looking for a holiday gift for the home chef on your list? Now through the end of December you can get the Hammer Stahl’s new 6-inch chef knife for $39.95 and the 5.5-inch Santoku knife for $29.95. I have an ongoing relationship with Hammer Stahl and will receive product and/or compensation for posts featuring their items. As always, all opinions are 100% my own. These are so beautiful! I am going to check them out…I need new knives! I'm in love with this shot. Perfect lighting. That is one very good looking knife! I would love to try it out. This is a great gift! And not too expensive either. Thanks! They are really pretty! I'm going to have to put them on MY Christmas list, Lol! I've been looking into getting new knives for the kitchen! Might have to check these out! I agree that knives ar so important! Good ones make all the difference. Good knives are so important in any kitchen! Especially pretty ones like these!!! Good knives are everything and those are beautiful! That's a gorgeous knife. I've heard of Hammer Stahl but have never tried them - you've got me curious! Those are beautiful! I love the handle!